The city I live in has been facing various extreme cold warnings recently and my body starts to crave more calories…Not being brave enough to go get groceries, I made these mini apple cheese tarts using whatever was left at home and they turned out scrumptious (like always)! Let the tarts warm you up! Peel and slice the apple. Combine apple slices and other ingredients in a non stick pan. Saute over medium heat, stirring constantly, until apples are almost tender. Let cool. Combine and mix dry ingredients in a bowl, add cold butter (cut into small pieces). Mix butter and dry ingredients with your hand until the dough can be roughly gathered together, do not overwork. Roll out the dough and fit into greased tart pans, discard the excess dough. Poke the crust with a fork. refrigerate for later use. Note: Taste of Mascarpone is more subtle than cream cheese, you can choose whichever you prefer. 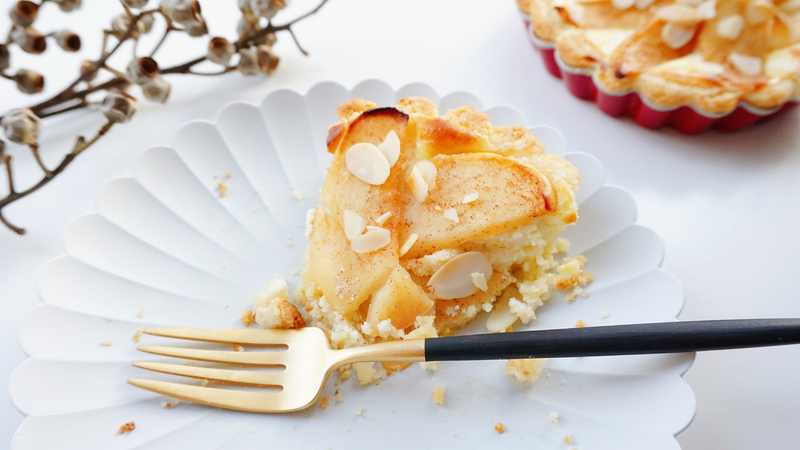 Pour cheese filling into crusts, place apple slices on top then garnish with sliced almonds. Preheat oven to 200 C, bake for 25-30 min until crust is golden, the cheese filling should be set then. Golden delight. Be extra careful when transfer tart from baking pan, it’s fragile! When served hot, the taste of cinnamon apple is more significant. When served cold, the taste of cream cheese filling becomes more obvious. The tart is delicious no matter served warm or cold.